or to my Facebook page www.facebook.com/msshortcakes as the first point of entry, into my world as a cake designer. They can view the sort of cakes I create there, and it should give them an idea as to what is expected from a cake by Miss Shortcakes. From there on, if they ask me again, “Can it be ice cream cake on the inside?”, that’s when I politely direct them to the nearest ice cream parlour. Cake designing is pretty unfamiliar territory for a lot of people. Most do not realise how long it takes to create a custom cake, from start to finish. I thought this week, since I designed a cake from an invitation card and theme, it would be a good idea to share the entire process. Generally a safe time frame to book a novelty cake is around 2 – 3 weeks prior. This gives me enough time to conceptualise the cake, design and plan, liase with the client, start making any decorations which need time to dry, and make purchases for special items if need be. So, the initial contact obviously comes from the client with the theme of the party. 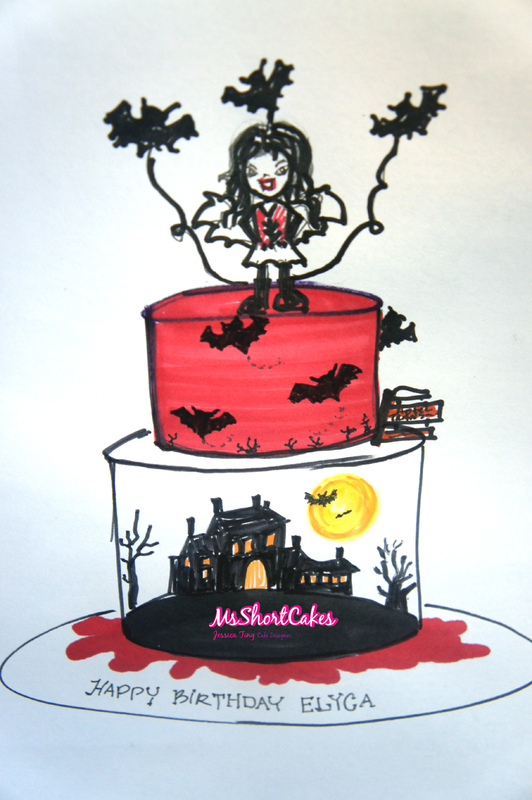 I receive the invitation card which contains the picture of the vampire girl, that she’d like as the cake topper. I also get information on the theme of the party, which is ” In the Spirit of Halloween”. She also tells me that the kids will be watching the new Sony movie Hotel Transylvania at the start of the party. 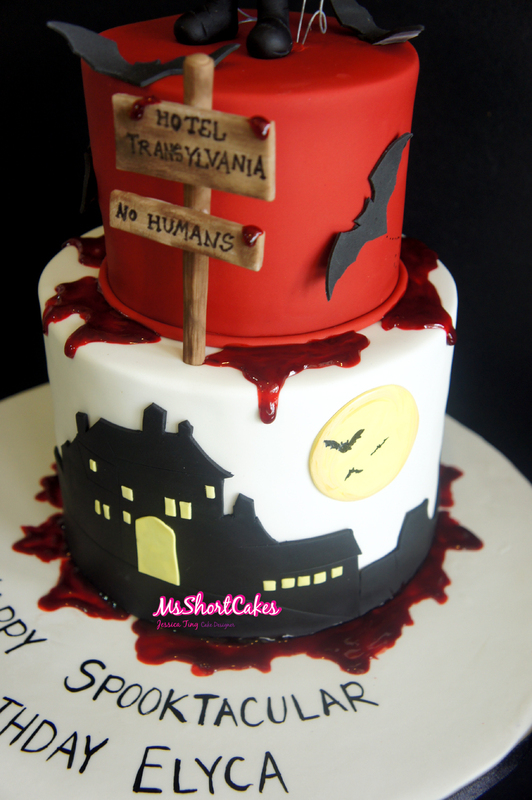 The “must haves” on the cake are the usual Halloween suspects of bats and blood. With all that information at hand, I can now start to look for ideas and references on the internet. 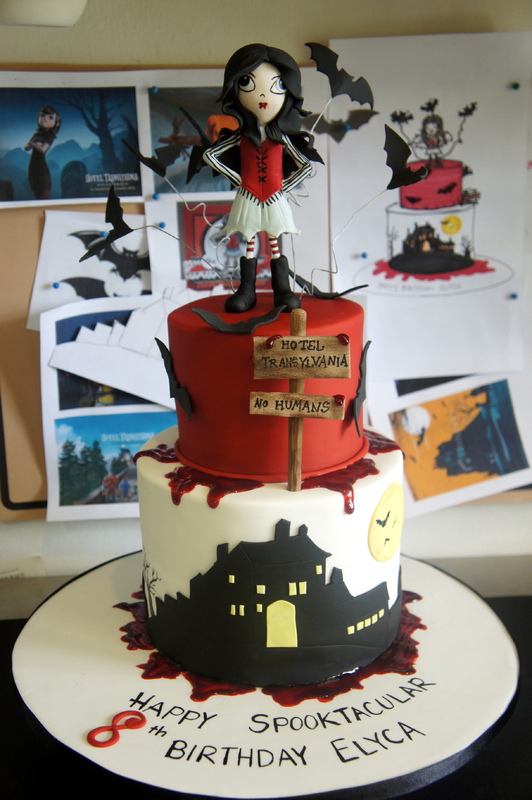 I search for Halloween cakes, pictures from the movie Hotel Transylvania, anything at all that will give me inspiration for this cake. Once I shortlist the pictures, these get printed out to create my “Mood Board”. Then, the designing process begins. Some designs can be as quick as a couple of minutes, and some cake take up to 4 days to draw up. It really all depends on how all the elements work together on cake. 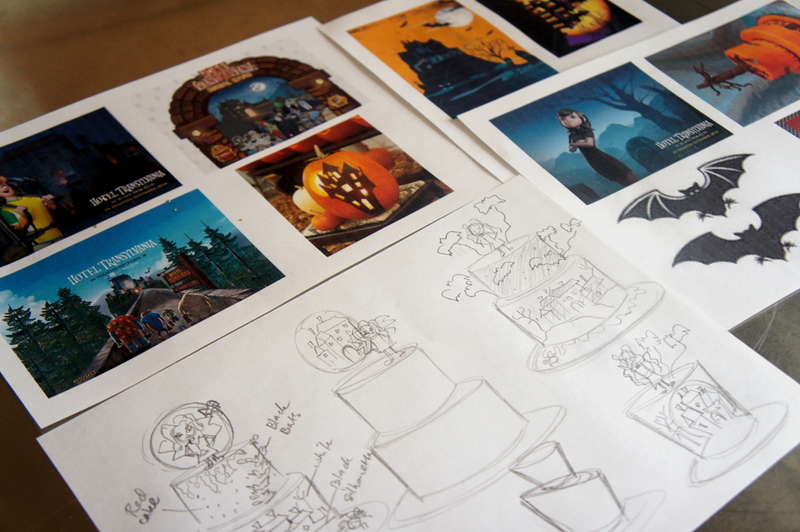 My Halloween Mood Board and rough sketches. I toyed around with a few different shapes for this cake – Madhatter, tapered, extended tiers etc. A fun cake design like this, usually works best on a non-traditional shape (single tier or 2 tier, one on top of ther other). 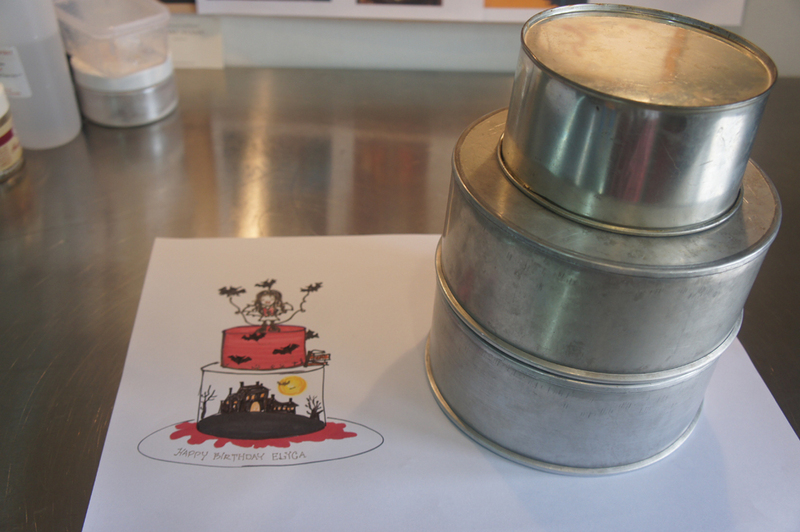 After 5 or 6 rough sketches, I decide on a 2 tier cake, with the bottom tier, extended in height. So this means, the bottom tier will have 2 cakes stacked together, then iced, to make it look like one tier. Not only will this make it look tall, it will also give me the room to create the silhoutte of the hotel from the movie. Using the colours from the invitation card of red, black, and white, the top tier is iced in a deep red icing. 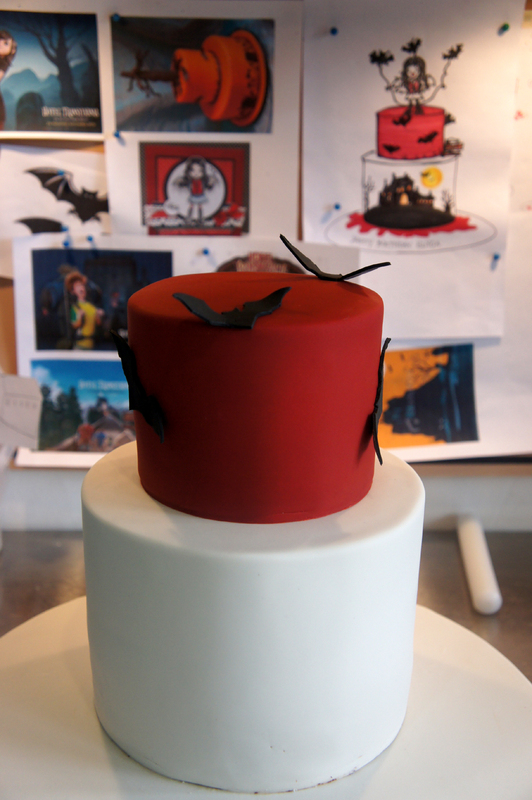 The bottom tier is white, with a black silhoutte of the hotel and around the entire cake, there are scary looking trees, graves and bats flying in the moonlight. Vamp girl stands proudly on the top tier, with lots of bats flying around here. And to finish off the cake, blood is oozing out from the cake. I get this scanned and emailed over to the client, and fingers crossed, all will be approved. Thankfully this time, it’s all good and I get to start work. If there are changes, then it’s back to the drawing board. So this is why, it’s always good to organise your cake at least 3 weeks ahead of time. 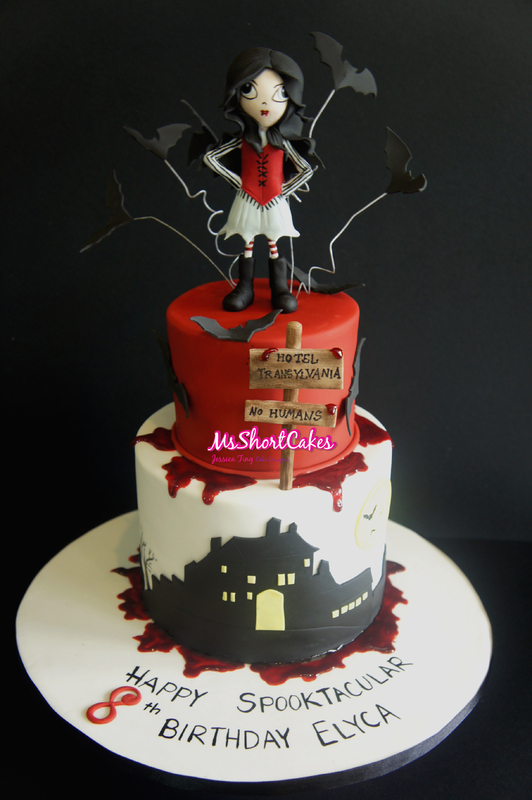 The most time consuming element on this cake, is the figurine of Vamp girl. If I’m lucky, I’ll get to work on her over a period of 2 days. Parts of her need to dry overnight, before I can finish her off, as neatly as possible. Then, it’s the bats on wires. These also need a good 3 – 4 days to dry for them to hold up on the wires, in this humidity. 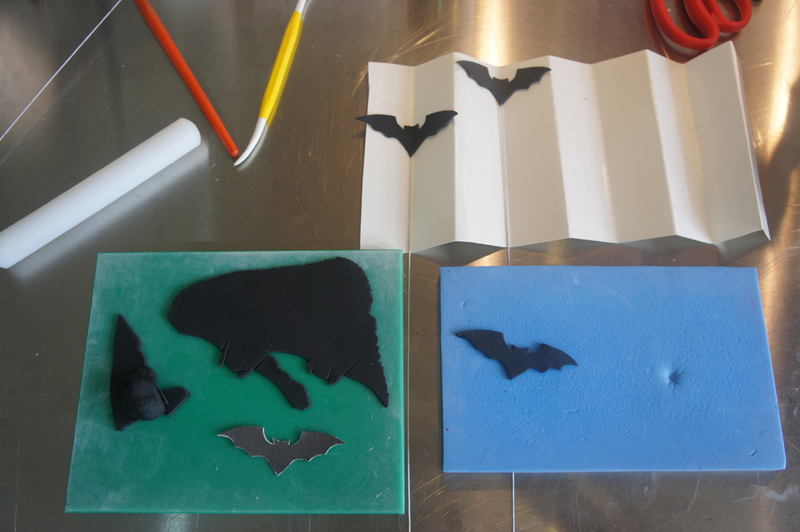 The bats are cut out from a template I made using a picture of a bat, I found on the internet. Then the wings are thinned out slightly using a ball tool, then a wire inserted into the body. I have a cardboard setting tray which I made myself to lift up the wings on an angle. This makes the bats look like they are flying, rather than a flat one. Then I move on to making the other bits and bobs that can be made in advance. And a couple of days before the party, the baking begins. The cakes are then cooled overnight in the fridge, before they are prepared for the ganaching process. This is where the cakes trimmed, filled with chocolate ganache, then masked with more chocolate ganache, to create a near perfect foundation for the rolled fondant icing. I must stress that the ganaching process is THE most messy and important part of cake decorating. Some cakes can be ganached in less than 30 minutes, whereas the more complex shapes can take up to an hour and half alone! If your foundation is rough and wonky, then when the icing goes on the cake, all the flaws will show. And this will make your cake look totally unprofessional and all your hardwork making the beautiful decorations have gone to waste. I know I need to take pics of the cakes being ganached, but honestly it gets so messy, I don’t really want to stop and get the camera out with my mucky hands. LOL! But I will, one day. I will. Once they are ganached, they are rested in the fridge for a few hours, so that the fillings can set properly before the icing goes on. There’s the cake, iced and ready to be decorated. Fun time! I also like to dry the cake overnight in the air conditioning before the decorations go on. This gives me a harder and drier cake surface to work on, and more often than not, the end result is always neater. So, the million dollar question would be….How long did it take?